In 2012, we commissioned a new observing mode for ALTAIR LGS known as LGS+P1. In place of using a nearby tip-tilt focus (TTF) NGS, we have added the option of using a peripheral wavefront sensor (PWFS1 or P1) for the NGS TTF measurement. This mode does not provide diffraction-limited resolution, but instead gives “super-seeing” by reducing the natural seeing PSF FWHM by a factor of 2-3. The major benefit of this seeing-improver mode is that it increases the LGS sky coverage to almost 100%, providing a significant level of PSF correction for a wide variety of applications. To enable LGS+P1, the P1 wavefront sensor was upgraded, replacing the 6 x 6 lenslet array with a 2 x 2 array, thus increasing its sensitivity. A narrow band (FWHM = 10 nm) notch filter was installed to block out the Rayleigh backscatter for the laser propagation, while still allowing the standard set of filters to be used. Currently, LGS+P1 has been commissioned with NIRI in f/14 and f/32 configurations and with NIFS. It is important to know that significant flexure issues remain (see section 3.0 below) which limit the use of this mode on targets that are not visible during acquisition and also drastically limit the amount of time that a target can remain in a spectroscopic slit. We are currently working to resolve these issues. The performance on-axis will improve the image quality by a factor of 2-3 over the natural seeing. We have tested this in a small variety of seeing conditions, as shown in Figure 1. Figure 1: Delivered image FHWM for both NIRI f/14 and f/32 exposures for a range of natural seeing conditions. Figure 1 shows the LGS+P1 mode performance measured from individual exposures for two nights worth of test data taken under a range of seeing conditions for both NIRI f/14 (texp = 30 sec) and f/32 (texp = 10 sec) configurations. These preliminary results indicate that use of LGS+P1 improves the “effective seeing” from IQ70 to IQ20. The bottom panel illustrates that K’-band correction is better than H and J. More data are required to assess the effective IQ benefits for excellent seeing cases. Note that for all these data the P1 guide star (using the R filter) was ~ 5’-6’ from the field center. 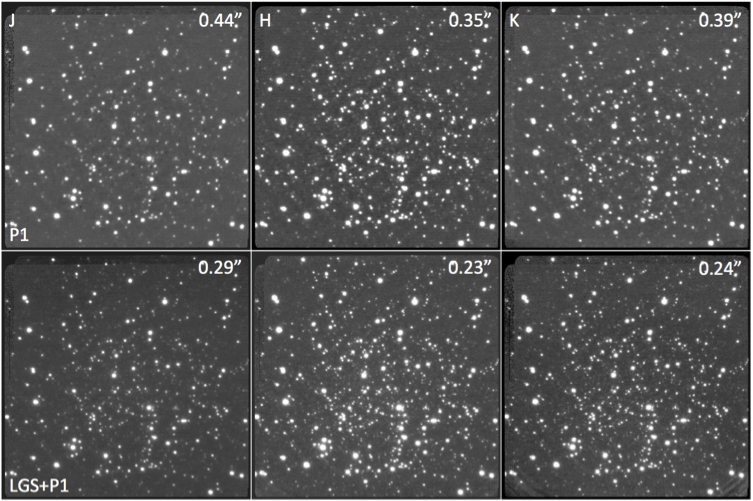 Figure 2: NIRI F/14 images of the central region of NGC 2419 for seeing-limited P1 guiding (top) and LGS+P1 (bottom) for (left-to-right) J, H, and K’ bands. Each image is the co-added sum of four 30sec exposures. Figure 2 compares a sequence of seeing-limited images with P1 guiding (i.e. non-LGS native seeing) to corresponding LGS+P1 images showing the decrease in the mean FWHM across the images for three wavebands. In f/14 mode the FoV is 51.2” and the PSF variability, as measured by the FWHM dispersion, across the field is ~ 6% for both seeing-limited and corrected images. For these data the P1 guide star was ~ 5.6’ from the field center. For the corrected data, the ALTAIR estimated V-band seeing was 0.40”, 0.40” and 0.46” when the J, H and K images were taken, respectively. 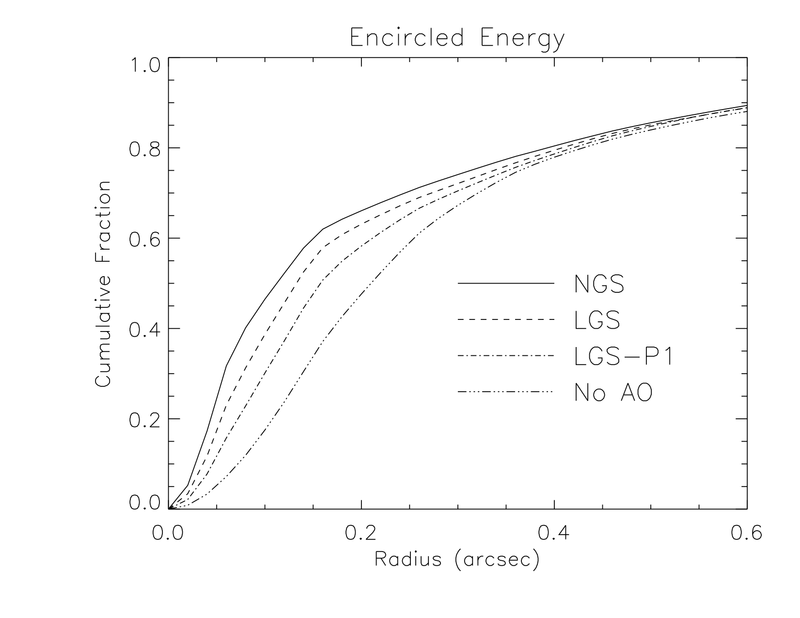 Figure 3 shows the encircled energy fraction as a function of radius in the NIFS PSF for different guide modes. These are empirical measurements, taken under similarly good seeing conditions. The 'NGS' case used a bright (R~10) on-axis guide star. The 'LGS' case used a moderately bright on-axis tip/tilt star (R~14), and the 'LGS-P1' case used an R~13.3 guide star some 6 arcminutes off-axis. 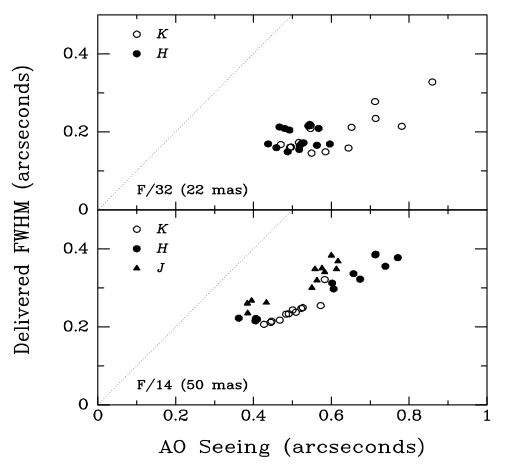 The 'No AO' case used an R~10.7 guide star with the 'P2' guider. Table 1 provides a summary of the PSF parameters and natural seeing conditions for the different observations. PSF FWHM (diameter): 0.10" 0.12" 0.13"
50% encircled energy radius: 0.11" 0.13" 0.16" 0.21"
80% encircled energy radius: 0.39" 0.43" 0.42" 0.43"
Table 1: Parameters of K-band NIFS PSFs shown in Fig.3, giving the empirical Full Width at Half Maximum (not from a model fit); the 50% and 80% encircled energy radii; the fraction of energy falling in a circle of equivalent area to a single NIFS spaxel (0.103" x 0.042"); and the optical (approximately V-band) seeing conditions during the observation. Figure 3: NIFS PSF encircled energy for various guide configurations. "NGS" is classic natural guide star AO with a bright on-axis star. This should give the best AO correction. "LGS" uses a moderately bright (R~14) on-axis star for tip/tilt and focus corrections, and the on-axis laser guide star (LGS). "LGS-P1" uses the LGS on-axis to correct high-order terms, and an R~13.3 guide star on the peripheral wave-front sensor some 6 arcminutes off-axis. "No AO" is for a similar peripheral guide star, but with no on-axis laser correction. Table 1 provides the PSF metrics. The limiting magnitude of P1 is R ~ 14 so that the guide star limit is brighter than for the conventional LGS mode, but this is more than offset by P1's much larger patrol field. 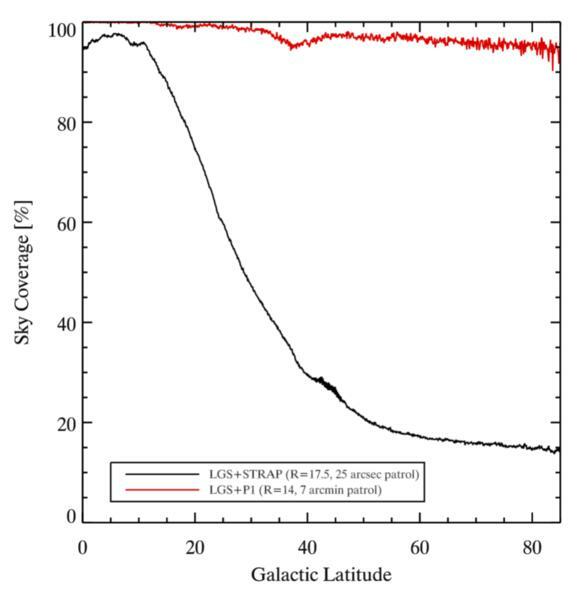 Figure 4 shows the predicted sky coverage as a function of galactic latitude for the LGS+P1 configuration (red) compared with the conventional LGS mode (black). Figure 4: Comparison of estimated sky coverage for LGS+P1 (red) compared with conventional LGS (black). Note that sky coverage refers to the percentage of sky with guide stars above elevation 40 at Gemini North. It is expected that LGS+P1 mode will be used with the NIR instrument suite at Gemini North which comprises NIRI, NIFS and GNIRS. Note that for all instruments SNR estimates can be obtained by using the non-AO Integration Time Calculator (ITC) assuming an IQ = 20% and CC=50% (the CC conditions for Laser use). There are still a significant number of software modifications needed to reach operational efficiency. Currently, the issue with the greatest impact to science is that significant flexure is seen between the P1 tip/tilt sensor and the various science cameras. This flexure has been measured to be of order 0.4 arcsec per 30 minutes with NIRI, which is similar to the full width at half maximum (FWHM) of the point spread function (PSF). The implications of the current flexure is that slit spectroscopy and blind offsetting are limited by this magnitude of flexure. Thus, for spectroscopy we require that a continuum source be visible (S/N > 1 per spectral element) somewhere in the science frame for typical exposure times (~15 minutes). In addition, we cannot support blind offsetting (i.e. invisible targets) at this time, since we have no way to independently check if the target has moved out of the science beam nor is the P1 probe mapping reliable for large offsets at this time. This limitation is one of our highest priority issues. However, since this is a work in progress, part of the shared risk nature of this mode includes the possiblity that we may not be able to implement the flexure model, or the magnitude of flexure may be larger or more difficult to correct than expected. In addition, this flexure may significantly complicate reduction as there may be a ~0.2 arcsec image motion every 15 minutes. Operational efficiency is currently significantly lower than typical LGS. This is because there is signficant operational software work to be done to reduce acquisition times to the current typical LGS overheads. There is the risk that overheads may be larger than expected, which is part of the nature of the shared risk of the mode. Currently, we ask that PIs use the typical LGS overheads listed elsewhere, but be aware that fewer targets or less on-source time may be a reality. Proposals with scientifically viable contingencies will have an advantage in the case that operational efficiency is still reduced when the semester starts. To estimate exposure times and feasiblity of targets (i.e. that they are visible in the science instrument), we ask that PIs use the Integration Time Calculator (ITC) for the instrument of interest in non-AO mode assuming IQ=20%, CC=50% conditions. Very roughly, the ITC suggests that for broadband point source imaging, there must be a target in the field with magnitude 22 or brighter to satisfy the flexure requirements (S/N > 5 in a typical exposure of a few minutes). For spectroscopy, the limits are about magnitude 20 (S/N > 1 per continuum spectral element). For extended sources or narrow-band emission lines, PIs should estimate target viability by consulting the ITC directly to ensure that the observer can acquire the target (or another bright target in the same slit for GNIRS) by direct imaging and that the spectra are visible in each exposure so that any movement out of the slit (for GNIRS) or within the IFU (for NIFS) can be tracked. LGS+P1 has been tested for f/14 and f/32 in the J, H and K bands. It will be available for use in adaptive optics imaging mode as described in the NIRI imaging pages. The NIFS top-level spectroscopy page gives information on the spectral and guiding properties. 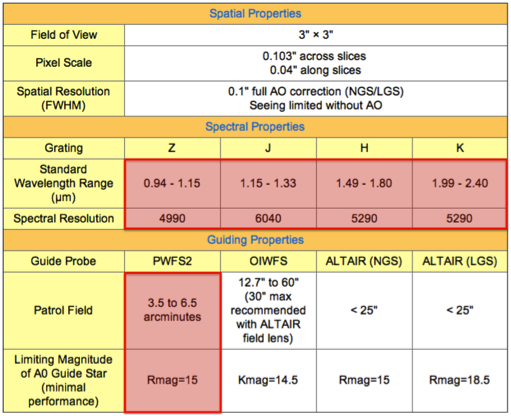 This table is reproduced below and for use with LGS+P1 use the PWFS2 patrol field and limiting guide star magnitude (highlighted). The highlighted region of the spectral properties indicate the grating modes which need to be commissioned. GNIRS has not yet been commissioned with the LGS+P1 mode. This is available in shared risk mode for spectroscopy using the long and short cameras in cross-dispersed and long-slit modes and also for imaging for X – K bands. 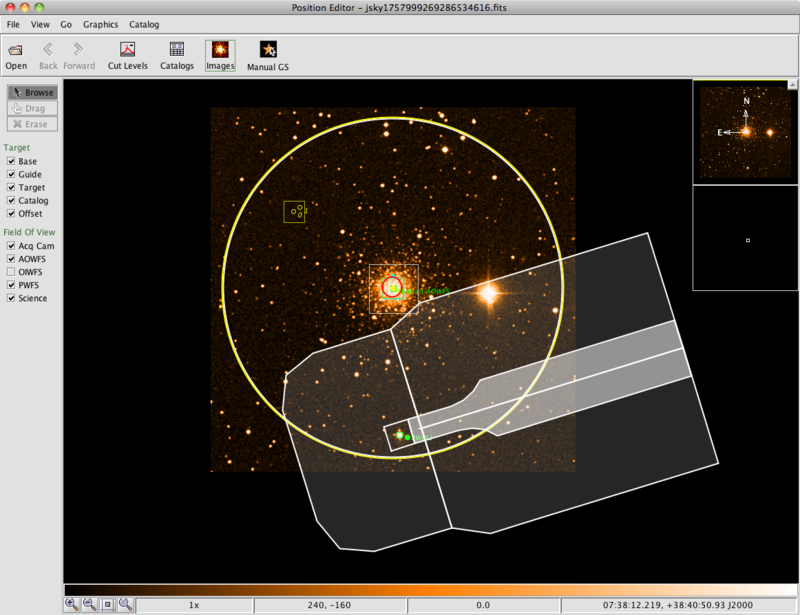 To help visualize the geometry of the field, we include this example image from the Observing Tool. In the image, the laser guide star appears in the center of the globular cluser and the P1 tip/tilt/focus star is towards the bottom of the image, about 7 arcminutes from the science target. The red circle shows the ALTAIR patrol field used for traditional (STRAP) LGS.